Google I/O 2014 is near, there can be many new stuff like Android version, hardware, software changes by Google. However, we've also been able to get some relevant information about the future of Android by looking at recent AOSP merges. Google recently killed Dalvik and made ART default in next Android version. That, however, is not the only piece of information that can be had about the future of Android. New merges to the AOSP master branch by Googler Andrew Hsieh indicate that the next major version of Android will revise API level naming convention. Till now, Android API level naming convention has dictated that all versions receive numerical API levels. 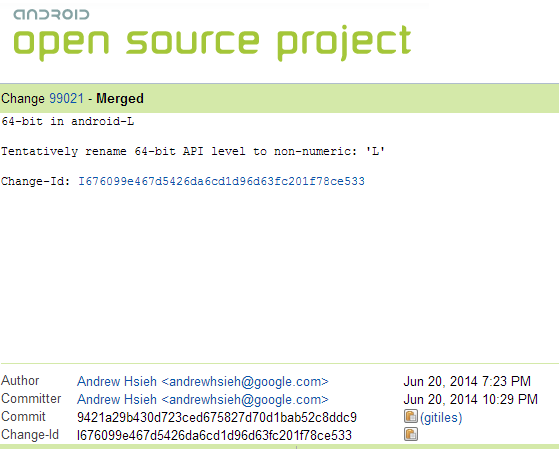 This started with Android 1.0, which was API level 1, and has continued onward to KitKat, which is API level 19. Now according to two recent merges to the AOSP master branch, it seems like 64-bit API levels will be renamed to non-numeric characters not a number but a letter, with the 64-bit iteration of the Android-L release receiving the letter “L” for its API level. The merges themselves says that this new naming convention is tentative, though this will make things easier for developers creating native apps with the NDK. What do you make of all of this? Share your thoughts and conspiracy theories in the comments below.